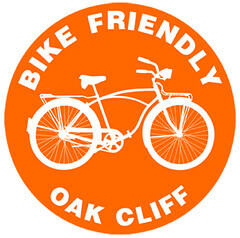 Bike Friendly Oak Cliff is a Dallas-based 501c3 nonprofit focused on creating a more bike friendly community in Dallas through family friendly bike events and activities, installation of bike infrastructure, and bicycle-related advocacy. BFOC’s annual events rise awareness and promote cycling as a fun and safe transportation option. BFOC was founded in 2008 by a small group of friends in Oak Cliff looking to organize fun rides with their neighbors and promote a bicycle-friendly culture in Dallas. We’re exited to see so many Bike Friendly neighborhood organizations springing up all over DFW! Celebrating the team that brought the streetcar to Oak Cliff! All events are family-friendly, free, and open to all regardless of age, fitness levels or biking ability. Generally, the goal of the events is to rise awareness for bikes and encourage more people to make riding a part of their everyday lifestyle. BFOC plays an active role in reshaping how Dallas streets are designed, ensuring that future streets will be safer for cyclists. The organization has raised over $5000 for as part of the iBike Rosemont campaign to install road improvements in front of Rosemont Elementary School that will improve cyclists’ safety. Board members work closely with the City of Dallas’ Bicycle Coordinator on identification, design and implementation of bike infrastructure improvements in Oak Cliff and throughout Dallas. BFOC’s parent organization, the Oak Cliff Transit Authority, was instrumental in attaining federal TIGER Grant funding to install a modern streetcar to connect from Union Station across the Houston St Viaduct into North Oak Cliff. The streetcar opened the final phase, Bishop Arts District Station, in August 2016. 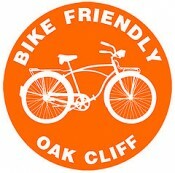 Bike Friendly Oak Cliff has been fortunate to receive financial support from a number of local and national sources. Funds for the Rosemont Elementary improvements have been raised from local sources including Cienda Partners, Oaxaca Inc., John Barr & Associates LLP, and Eno’s Pizza Tavern. To support a Cyclovia event planned for Spring/Summer 2012, BFOC received a grant from Bikes Belong, a national bicycle advocacy group. BFOC has also held occasional fundraisers which have been successful in both raising awareness for the organization and receiving donations from the community. Part of BFOC’s success has been due to the organization’s strong media and online presence The BFOC website averages 285 daily views with over 100,000 views in 2010. Additionally, BFOC events are well covered by both local t.v. and print outlets. what a great idea this whole concept is!! please keep us posted on other activities. I have a story up about your conflict with PM Summers at http://austinbikeblog.org/2008/11/26/why-cycle-dallas-will-never-get-a-link-on-our-blogroll/ . Would you guys like to add your own comments there on the situation? Also, would you like to talk off-line about this and other cycling issues? I don’t get Facebook access at work, but please notify me of future rides. If there is one for the Footsteps of Oswald on a warmer day, I’m in–I’m a JFK buff. Nice to know there is a cycle group in Oak Cliff! I use to ride df when much younger, but, now am completely divoted to ‘recumbent trikes’! How do you feel about recumbent trikes? We update rides, photos, and news links from the site. I can image you’re jealous of me: I live in the Netherlands and we have thousands of kilometers of bike lanes to ride across our cities and between cities. I think the picture on top of your website is taken in Amsterdam, our capital. And I think it’s a good thing you bike lovers try to persuade the local government to create more bike lanes. It’s safer and at least it’s more pleasant to ride a bike without having to look over your shoulder every few seconds. Therefore I wish you lots of success in your war on bike lanes. On the other hand you have no idea how much I envie you.Boy, how much I would have liked to ride your Oswald ride through Dallas and Oak Cliff. I was a 12 year old boy, living in The Netherlands when Kennedy was killed at Dealey Plaza. For some reason this had a great impact on me. I still like to read anything concerning that day in 1963 and concerning Lee Oswald. After reading dozens of books and hundreds of webpages I am convinced that Oswald and Oswald alone killed JFK, but it always remained a mystery to me how it was possible that the leader of the free world in those days was killed on broad daylight while a crowd of people were watching, pictures were taken and amateur films were made and still, after 45 years, there is that slight possibility that Oswald was part of a conspiracy. Maybe that’s why I promised myself that one day I would visit Dallas and Dealey Plaza being a place were history was made. And although I have been to the US a couple of times I never came as far as Dallas. So you understand that when I read in the Dallas Morning News (which I do occasionally hoping there is something in it about the asassination) about your ride, being a bicycle friend (and a biker) myself, I thought this is a great initiative and one day I hope to be riding there with you. Until that day I wish you all the best, be careful on your bike and whenever you need information or pictures or whatever from the Netherlands, don’t hesitate to contact me. I own a restaurant in Denton, Tx. and have been desparately looking for a place in the DFW area to purchase bike racks. I can find them online but the shipping cost is prohibitive. Any suggestions? You might talk to a local bike shop and see if they can get you a deal on ordering one for your shop. Please reconsider posting your rides on this page. I’m another one that can not get to facebook at work or adding us to an email group. We always post the rides on both sites, so check back to for updates on next events. found this link pretty interesting. Kids do the walking or riding and our “Freikometer” does the counting. Trips to school add up throughout the school year and are redeemed for prizes at an end-of-year school party. It’s that simple. Join the movement that’s inspiring kids to change their own health, our schools, our communities and our world – one trip to school at a time. Become a Freiker today! Check out our NEW cycling event, http://www.wish100.org to benefit the Make-A-Wish Foundation of North Texas. You do not have to fundraise to participate. Simply register, ride and enjoy! For more information, please contact Erin Michel, emichel@northtexaswish.org. Beth – I’m signed up for the Role Beyond Coal campaign too and will be on the call tonight (in about 20 minutes!). Hope to hear your voice and organize a Metroplex-sized event. Oh man, I missed the call (well, tummy achey child and my own technological ignorance worked against me), but I’m excited about getting more involved. Was the Roll Beyond Coal teleconference productive? Beth – Email Lori Peniche (lori.peniche@hotmail) – she’s getting the Dallas group started. Just tell her that I forwarded her info to you. Unfortunately, Kavala will no longer be participating in the discounts. Thank you. Thanks for the note. We change the byline about once a month, and typically in line with a specific article. In the one you’re referring to, we’re not opposed to bicycle wear, we’re stating that we are a blog promoting casual commuter bicycling over sport. It would be no different than stating, “we’re a blog promoting 100% cream free coffee”. It doesn’t mean we’re opposed to cream, just that we won’t be the place to go to find information about it, because we promote black coffee. Hey, thanks for the clarification. I guess the reference to a specific article was lost on this occasional reader. I don’t think that is the type of bike lane this organization is advocating. Let’s hope Dallas can do better than Ft Worth and Richardson have done so far. I wanted to send you my contact info, and to offer any assistance you may need with either bike or transit projects. As I mentioned, I tried starting up a bike-sharing network about a year ago (with no success). If this is somehting you may interested in, maybe we can get together and discuss. Any fun events planned for November? I thought i would put back in what i’ve gotten out! Thought you might like to see what im doing. The Dallas Parks Department is planning improvements on the trail system on the east side of White Rock Lake. The plan should include bike lanes on East Lawther – which is closed to car traffic on most of the east side, and where not closed, is a series of cul de sacs – ending at the Bath House, the sailing clubs, Winfrey Point, etc. The Park Board member for the area is Darren Boruff. Ask him to ask the planners to include bike lanes on East Lawther. Make it safer for all cyclists. The Councilmen for the area are Angela Hunt and Sheffie Kadane. Since most cyclists ride White Rock sooner or later, its essential that the east side have bike lanes. Of all the streets in Dallas that might need bike lanes, I would have thought a park road closed to through traffic would be pretty low on the list. Bikes and peds probably outnumber cars on that road. Besides, if you are not comfortable on the street wouldn’t you just ride on the trail (once it is rebuilt)? The WRL plan is to re-do the road and trail on the east side of the lake. Since the road (West Lawther) is closed to cars in places, there would be no need for bike lanes there – but it is open to cars in other sections, so the idea is to do bike lanes there – where it is open to car traffic – to facilitate bike usage. And to leave the hiking trail – which is separate from West Lawther – at its current width – to be used primarily by pedestrians. This should tend to take pedestrian traffic off of West Lawther (where most bikes are). Thought I’d let you know that http://www.baufl.org is going live tomorrow. The Million Car Challenge Campaign. I just read (while sober) my reply to Stuart. The redo at White Rock Lake roadway is to the East side = hence the bike lanes would be on East Lawther, not West Lawther – which has no bike lanes. Whole idea is to make sure that bikes get some protection around WRL – on any re-do of east side roadway. As Stuart notes, East Lawther is not exactly high traffic – but it is a prominent bike route – so might as well get Parks to treat it as such – to demonstrate bike lanes. If I wished to start a branch of B.F.O.C in Deep Ellum, are there any guidelines or stipulations? It would be a small group as I have only seen a few other riders on a regular basis. I have a feeling more would come out of the woodworks if B.F. Deep Ellum were started up as a group ride. I have been following and participating when possible since Cyclesomatic. It is truly amazing how Oak Cliff has benefited from your organization. Drop me a line. I would love to hear your input. I want to remind everyone about The Ride Of Silence coming up WEDNESDAY, MAY 19, 2010, 7PM. It’s taking place at White Rock Lake, on the west side. Start and finish are at the Branchfield-Fisher Road parking lot. The ride takes place all over the earth on the same day, at the same time. It’s the only event to achieve that feat. AND IT’S FREE! Cool! The is a memorial ride to remember cyclists that have been killed or injured by a motorist. We encourage everyone to wear a black arm band, but if you’ve been hit by a motorist you may wear a black arm band and a red arm band, too. Check out the web site: http://www.rideofsilence.org. passing on the info 🙂 thank you for the inspiration. Hey, we have been giving a 10% discount on food at the Beckley BrewHouse for over a year now but never received our ‘bike friendly’ sticker. Do you have any left? Also, I hear that you may have funding for more bike racks. How do we sign up to potentially receive one? Thanks! hoping everyone knows about Kessler Krawl on July 10…8 houses open showing off secret gardens..food provided by Oak Cliff restaurants including Bolsa and Smoke. I’m proud to say my house at 923 Salmon is one of them! I didn’t even realise the BFOC existed! Definitely needed, especially now I have fully switched over to my bike! a newbie in dallas after being in portland for 4 years. thanks for the site, awareness and dedication to increasing bike awareness and infrastructure. obviously dallas needs some help; but i think there’s a lot of motivated people around here. the increase in trail construction is step #1 (to simply get people on bikes), step #2 we’ll take to the streets! Q: Who can I vote for that supports TX BIKES? Anyone tracking this? By casting a ballot in the General Election, you have the power to influence who will make these critical decisions. Early voting is from October 18 – 29, or you may cast a ballot on the General Election Day, Tuesday, November 2, 2010. Again, to vote in the November 2, 2010 General Election, you must be registered by Monday, October 4, 2010. For additional voter information, please contact the Elections Division at 1-800-252-VOTE (8683) or visit http://www.TexasHealth.org/Voterinfo. The Matrix Challenge is the oldest bike race in Texas. It will once again be going full blast on Swiss Avenue at the campus for The Meadows Foundation. Dates are April 16th and April 17th from 7:00AM till 7:30PM both days. Pro race starts at 1:00PM both days. Kiddie Race at noon. Please note that all kids who parricipate (event is FREE) will receive a really cool medal made out of recycled bike parts with the race logo laser-etched. We could use some volunteers if you would like to help out. This is a gorgeous race and is very spectator friendly. Easy to get to on a bike, too. I can send you a flyer, ad art, or anything you wish to help me get the word out. The Matrix Challenge is the King of Crits! BFOC, do you have an e-mail list? I’m not on Facebook because I am not a 16-year-old girl. I’m doing an unsupported ride across the state in May, and my route is going to take me through Dallas. I was curious if anyone has a good route to get from US 80 in Mesquite to US 67 headed to Cleburne? The documentary at 19:20, is what I wrote in 1987, distinctive for representing a peaceful relationship between police and protestors. I noticed you’re using WordPress for your Blog and were a fellow Cyclist. I also use WordPress and have developed a Plugin that you may find useful (it’s free btw). The WP-Routes Plugin allows you to embed Cycle Routes into WordPress posts. I’ve set the following page up for more info and a link to download the Plugin. Ps. Sorry to contact you via your Comments but I couldn’t see a Contact page. Hi, my name is Branden Andersen. I’m a reporter working on a story about bike advocacy and change in government at the grass roots level. I was directed to you by Jonathan Maus at bikeportland.org. From what he said, I understand that you guys are doing a lot for your city, and are emerging as a flag ship for smaller cities making a biking difference. I was hoping to talk to you before the week was out about your experience in making your city a biking oasis in Texas. Hi, my name is Branden Andersen. I’m a reporter in Eugene, Oregon doing a story about bike advocacy and grassroots groups that are making a difference for their two-wheeled transports. I was recommended to you by Jonathan Maus at bikeportland.org. He said that you guys were doing some great things down there. Would you be interested in a quick interview to talk about your experience with Texas government and how you got to where you are now? Shoot me an email if you are.